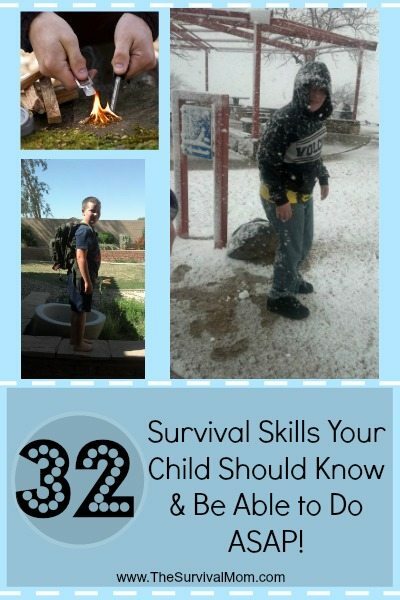 32 Survival Skills Your Child Should Know and Be Able to Do ASAP! Knowledge is something that takes time to develop, so we need to start teaching the next generation now. In case, God forbid, our children are left to fend for themselves or we are injured or even just to make your family more apt to survive, every child must learn these basic survival skills everyone should know so they can pull their own weight and contribute as much as they can. Food water and other survival basics make up only a part of this list. It’s not just physical survival we need to teach them but mental, emotional, and spiritual survival as well. If your family learns now to be a well-oiled machine, you will be more likely to survive any type of collapse. Only you know the maturity of your child and what they are capable of physically and mentally. Also, take into consideration their natural interests as well as local opportunities. For example, when we lived in Phoenix, going fishing wasn’t all that easy of a task and we had to travel many miles to get to a decent lake. Living in Texas, my son can ride his bike to a river not more than a mile or two away and fish for hours. Your locale can help you decide which activities on this list are most feasible. Select one item from this list, do a little research to figure out how to best teach the skill (and maybe learn it yourself!) and then schedule a date to get started. Have fun! Grow vegetables from seeds. This isn’t the easiest skill to master and you’ll need expert advice. Have local edible and medicinal plant foraging skills. This book is a must-have for foraging beginners with its large photos and simple text. Self-defense is another important basic survival skill everyone should know, not just kids. Be hardworking and a self-starter and a family helper, not a complainer! Have a strong faith in God (morals, memorize Bible verses, prayers, songs, and have a hope for heaven). Ultimately, everyone reaches a point in which their physical, mental, and emotional abilities are completely taxed. Spiritual survival can make the difference between giving up and finding strength from somewhere to hang in there, just one day at a time. Have a Baby? Be Prepared! To open a can: If you have a sturdy knife you can open one without concrete. What you do is hold the knife vertically with the tip against the edge of the lid near the lip. Drive the knife into the can with a sharp blow. Move the knife over and repeat until you have cut through enough to get the food out. I live in the countrry where there is no concrete. I have used this method when I misplace my can opener. I would recommend a sturdy paring knife as a carving knife might be hard to control. An Old Hickory paring knife is the specific knife I used. At what age should a child start to really learn from this list? My daughter is five, and I want to start teaching her appreciation for living in and with nature, but I don’t know if she “gets” it yet. There is no set age for any of these. I would start by letting my child watch me doing something a couple of times, ask if he/she would like to help, and see how it goes. Even several 5 year olds won’t all have the same physical, mental, and emotional maturity, so it all comes down to what YOUR child is capable of. Dave – realize this post is from last year but to answer your question, it’s never too early to start teaching your children how to live outdoors. Keep things simple and make a game of the things you want to teach her. I just told someone else who asked a similiar question to look up a copy of a scout handguide. that will show you all sortsof things to teach kids. Most importantly, have fun. Start with clouds – weather’s first indicator, animal tracks, plants to stay away from and how to respect nature. Always use deadfall for wood and start teaching fire safety rules now. I have 10 Webelos cubscouts that are getting ready for their first camp out. Ages 9-10. They have been learning for the pst 6 months and some even before that. Have fun! What a great list. I definitely need to teach my kids and myself some more survival skills. great list unfortunately I dont know a lot of these things,any help would be greatly appreciated. Check out our Skill of the Month (see the top menu bar) and just start with something! Some of these skills can be grouped together so they can all be learned at once. Don’t forget how to swim, at least tread water and what to do if they fall into either still water or racing water (like a river). Another one – how and where to hide, inside different rooms or their house, how to find places when they are outside (in the city and in the country), and how to find places to hide when they are in other buildings, like schools, stores, etc. Also be sure to establish a safety word that only you and your children know. If you have to “find” them, tell them never to come out of hiding unless you use the safety word when you get to them (you can have a not safe word also, to use to tell them to keep hiding). Also, if you have to send someone else to them, tell them that unless the person knows your real name (not mommy) and the safety word, never go with them no matter what they say. Also tell them how to find help, who to trust, such as uniformed people, especially fire, police and military or if they are in trouble in a store, to ask a woman with kids with her for help instead of someone else. My little 4 year old guy has been a stinker about hiking, but recently has forgotten about his “hurting legs” as long as we are always looking ahead on the trail for the next wild edible. The trick here is for them to know they may only eat from the wild as long as they get mom (or another expert adult) to OK their foraging BEFORE they even have a taste. They need to know that mushrooms, plants and berries are sometimes toxic and can make them sick or worse. Next up, we’ll be bringing our sling shot along for target practice once we get far enough into the woods to shoot- another great hiking motivator. (: Also when we go camping we set up a shelter/fort by our tents and they have fun playing in it, as well as learn some basics of building ad hoc shelters. Fantastic list! I am proud of the ones my six-year-old already knows/can do, and this gives me lots of ideas of what to keep working on! I noticed in your 2011 and 2012 skill of the month series that you had bread making and tortialla making. I would add a month of sourdough bread practice. You can make risen bread without yeast but also quick breads, french style breads, pancakes, biscuits or rolls etc. The skill is in learning how to maintain the “mother”. It is not hard but should be learned before it is critical. The sourness can be made more or less depending on how the mother is handled and how long it is storred between uses. Some people don’t like the sour taste but it is not necessary to have a sour taste if you don’t want it. Cara, our skills for each month are scheduled for the next 12 months, but we can always post an article or two on anything we like! I’ll add sourdough breadmaking to my list of important topics and will try to write about it in the next few weeks. Thanks so much for the suggestion. A good way to get kids interested if they are already a little older or are a little stubborn is finding the right incentive. Your daughter who wants nothing to do with getting her hands dirt may be more interested if you show her how to do it on a Barbie sized scale the basic skill is what’s important and if you can make one for Barbie you can make a larger one when it comes down to it. My 10 year old loves making clothes for her barbules because aside from what they were wearing when we bought them if she wants a fashion show she’s gotta make the clothes. My boys are going to learn how to crochet a hammocks for their action figures this year and how to sew old socks into a small bag with pockets to keep their cars in (gotta put all those extra no match baby socks to some use). My kids love to cook no matter what it is so that one is never an issue for me. We play his and seek constantly and they are getting better about being quiet and not giving themselves away. You want to see some improvement in hiking skills send them on a treasure hunt with a map and a prize at the end. Try looking into geocashing (sp?) same principle on a larger scale. I’d start small and work them up to a big hunt. These are good SHTF survival skills, but until the SHTF kids need to learn urban / modern survival skills, too. Schools don’t prep kids for what you have on your list, and they also don’t prep them for knowing how to responsibly use credit, stay out of debt, manage a household, work on a car/house/other equipment, etc. You should do up a list that goes over modern skills every child should also know. What a valuable site. I just found this in searching for ways to prepare my daughter for emergencies in the wake of the heartbreaking tragedy in Connecticut. I am always thinking of how I would keep get and her soon to be born baby sister safe in the wake of disaster. My daughter is only three but my husband and I already are instilling the basics of safety. We talk about stranger danger, staying with a trusted adult, we planted and harvested a garden together, and we are starting her in martial arts soon. I try hard not to scare her but to empower her and educate her. I’m scared everyday for her well being but all I can do is give her the tools and enjoy every second with her I think I’m different than alot of ”survivalists” in that I’m a vegetarian and not a fan of guns. I do think you can survive without guns and if someone else has a gun well then it’s you or them and eventually you will lose. my husband owns guns and eats meat and we have taken her fishing before. I do want her to learn basic skills that may help her in the future and I talk to her about only eating meat when we need it to survive. Im not going to turn down squirrel if im starving. I also have no problem killing something if need be, but in our daily lives, there is no need. Anyway, again, helpful list. I agree with most of it, I dint believe in the Bible so instead I teach my daughter to be good, to respect others and to respect the Osbert. She is already a very smart, well rounded and gracious little girl. I teach a survival class at our local co-op, live in the National Forest with my family, took my 7 year old across the country hiking the PCT this last summer, and he is planning his first solo backpacking trip in the North Cascades this summer for his 8th birthday. He is the youngest to have ever done the PCT. I’m telling you straight up, as a long distance backpacker, a parent, and a family who is prepping, making a shelter outdoors in the wilderness has been shown to be a TERRIBLE skill to teach. You will spend more energy, calories, and time constructing something which will not withstand the elements enough to keep you safe or warm. Teaching yourself and your child where to find shelter naturally is what needs to be taught. That along with tarp and knot skills will save your kiddo, not shelter building. That is something of Bear Gyllis and Survivor Man shows for hype, not reality. Thanks for your comment Brynn! Makes so much sense. This list is great, but I am so ignorant on almost all of these. Is there any curriculum/book that anyone can recommend that teaches most or all these things? I still need to look at your skill of the month series but was wondering if there was a book, etc. Is there a program anyone recommends that teaches things like this as a group? Thanks in advance. Something, I am teaching my kids is preserving food. We are also raising our own chickens and going to teach them the humane way to slaughter and prepare it. I know that the kids are young but if I teach them as 2nd nature they will learn in case.. This is a great list! Now all I have to do is learn these skills myself so I can pass them on to my children. Awesome list! We have been working on a list like this for a while. I am glad that you compiled it for me. Thanks, Survival Mom! I am sorry, but what does number 32 have to do with survival? Why do you have to cram your beliefs onto children? Let them learn to think for themselves and if they believe in a God/Goddess that is their choice, but ‘Have a strong faith in God (morals, memorize bible verses, prayers, songs, and have a hope for heaven)’ has absolutely nothing to do with survival skills. This should be titled 31 things. #32 is not a skill that is an opinion. Why would you teach your child what you believe? Wow. I suppose if you are asking that, then you really don’t believe what you are practicing. Why do I teach my children the Bible? Because it’s the truth. Why don’t I want them to choose, because the others are wrong, and I don’t want them to make the wrong choice. Seeing as how there are only two religions in this world (one based on works and the other based on grace) I don’t want them to choose the wrong one. Call it arrogance, but the height of arrogance is saying, “I’m right and we’re not going to talk about it.” So yes, discuss it with your children. Let them be able to discern what is true and what is not, the last thing I want is for my child to be stuck in a cult. There is truth is this world. Truth corresponds to reality. Read the Bible – learn your history. Besides what hope will you hold out for your child if all there is is this depressing lap around the sun, until we get old, sick, and die. Cling to your humanism, materialism, and I’m better than others attitude but in the end you still have no hope. no way i am doing this all i need to know is……. Practice tolerance and respect for all. Teach your children these things. Tolerance and respect for others does not have to negate your strong belief in teaching your true faith in your God. Blessed be, and God/dess bless and keep you! Great list! Kids require special skills. One big one is understanding what’s going on and understanding that disaster can happen to anyone. Quest that’s something even adults could do. I do think that #32 is a nesseary survivel skill because if you have God with you and his word in your head you can get through any situation. Every single Bible verse is ment to help you in one way or another. It also teaches you that if you have faith, God will provide for you. If by any chance our government or you end up in a place were the Bible is illegal to process you must know the verses or else you might forget all the amazing things God has done for his people and the wonderful promises he made. I was OK until 32. A strong moral code is good, but make it inclusive. The Brave New World can do without religious wars. Whose “strong moral code”? That’s what always gives me a chuckle because people who espouse that sentiment generally believe that it will be THEIR “strong moral code” that will be adopted, more or less, by the masses. Couldn’t be more wrong. I believe #32 should have been #1 on the list. With God all things are possible ! God bless ! “Do as thou wilt” is actually Satanic not Buddhist etc (its an Aleister Crowley quote). For those who think God’s Grace is not even necessary to exist on a daily basis (let alone a survival epoch) this list is worthless to you and most likely also to your children as well. I feel it should be #1 on the list. The rest is details. #32 is survival moms’s way to keep a great moral, yours can be different, you dont have to judge her. This seems to be less about survival and more about prepping. Survival is typically short period of time. So skills like 1, 3, 10 and 11 seem more of a long term situation. Also get rid of 32. You don’t need God to survive. You don’t need religion to survive. You need common sense. Sorry, but I am not a big fan of trying to say religion has something to do with survival. I strongly agree with 25, 29, and 30. The whole list is good and people can take from it what they will. Don’t ridicule someone else’s plan that works for them. If you can’t use, good luck. Thanks for this list! I’m the Cubmaster for my son’s Cub Scout pack, and a lot of these activities are things we can incorporate into our meetings. This would be a good way to introduce kids to being self-sufficient. I think it’s a great list and am busy trying to teach as much as is possible to our 8 year old Grandson. We are all learning together. He already swims like a little fish but he doesn’t know about rapids and currents yet. He has been taught about God since he was a baby. If some don’t choose to teach their kids of God that’s fine. We will all deal with the outcome of our choices and actions. I need to find a good book on identifying edible plants. I don’t know those myself. Love and appreciate the info here. You do not need concrete to open a can. Use a rock, blacktop road ( be sure not to contaminate food)(, or any hard rough surface. you can buy military can openers at many sites on the web. We carry one on our key chains, in our bug out bags in the trucks, and hide some around property. We gave at least one to all our children, grandchildren and when old enough to our great grand children. Try both sizes. Janice, Google “edible plants”, look at “Mother Earth News” or “Grit” on the web. I have to agree with those who are citing Scouts as a good source for these. I was a Girl Scout (in the midwest, where Girl Scouts were a bunch of girls doing same things as Boy Scouts) and between Scouts and my family, I knew how to do all of the above at a fairly early age. I’m not a parent to 2 boys, and I’m active in their Scout Pack, allowing me to ensure that their Pack is exposed to as many of these skills, as early as possible. Both my boys are aware of the skills they are learning, and what purpose they might hold. I can attest to those who say to start young…. it becomes “normal” even if only when you’re out in the woods or whatever. My boys are now Webelos I and II’s, and I know that they are ahead of 99% of their peers when it comes to being able to do for themselves. For over 3 years now, they have helped hook up the camper, set it up, etc… they have been setting up their own tents, starting fires with various starters (match, lighter, carbide, etc), cooking over open flames, planning meals, packing their own stuff, and so on and so forth. It’s normal in our house, and they learned very early to rely on each other rather than mom or dad, so that the two of them as a team can do more than any one of us. Great list! Thanks for sharing. 1. Be careful who you trust with personal information. At 14, she is not permitted any social media accounts. Her internet use is limited. She has been taught to be careful in answering personal questions at school and other places. 2. Try for the middle of the road average appearance in dress and mannerisms. Don’t answer all the questions in class. Don’t discuss your grades with others. 3. Choose comfort and practicality over style. Not always an easy message for a 14 year old, but I want her to be warm and able to run if needed. 4. Value relationships over things. If we lose everything in a flood, our family is more important. 5. Think ahead. Plan. Prepare for possible adverse situations. 6. Choose high nutrient food. Most of the food in the grocery store is crap. Some of it is good. Here is how to tell the difference. Most modern medicine is crap. Some of it is not. Here is how to tell the difference. 7. Everything you are taught at school is not necessarily correct. Learn the material so that you can pass the tests. But in your mind question and be prepared to do the opposite, or at least think the opposite. Usually whatever is popular in society is not healthy in some way for us. 8. Treat everyone with respect, don’t tease or antagonize other people. Don’t deliberately exclude others. 9. You are loved. You are valued. God has a wonderful plan for you. Do what is right. 10. And the usual mentioned above such as making meals, laundry, growing a garden, sewing, knitting and crocheting, understanding the dangers of credit, working hard, appreciating delayed gratification, being grateful, developing faith and values etc. Doing my own little survival prepping. One thing I figured out was the best thing for being able to make fire is a credit card sized Fresnel lens, available on amazon in 10 packs for under $5 usually. Matches can get wet or run out, the magnesium striker is good, but alas it can run out as well. The Fresnel lens never runs out, will work even when soaking wet, and will last forever if its taken care of! I am new at prepping, only in the form of natural disturbances and realize there so much to learn to be self sufficient of the grid. This list of 32 is great . # 32 reminds me of the movie with Denzel Washington where he walks the badlands after mankind has bitten the dust. What gives him the power to keep going when there was nothing left in tank was his bible . I love your list, Wendy. We are coming up with a second list of “32 Survival Skills…” and we’ll include some of your suggestions. Thanks! I love what you’re doing! I’m the author of The Adventures of the Ball Bug Boys. I wrote this fiction chapter book for my grandsons. Although it’s fiction, it helps teach them a few survival tips and morals. Did I say it’s funny too and kids ages 7 – 12 love it! On my website I set it up for kids to interact with one another to share their own survival tricks. I think you made an error in the title of this piece. It should have been: SURVIVAL SKILLS THAT EVERYONE SHOULD KNOW AND BE ABLE TO DO.